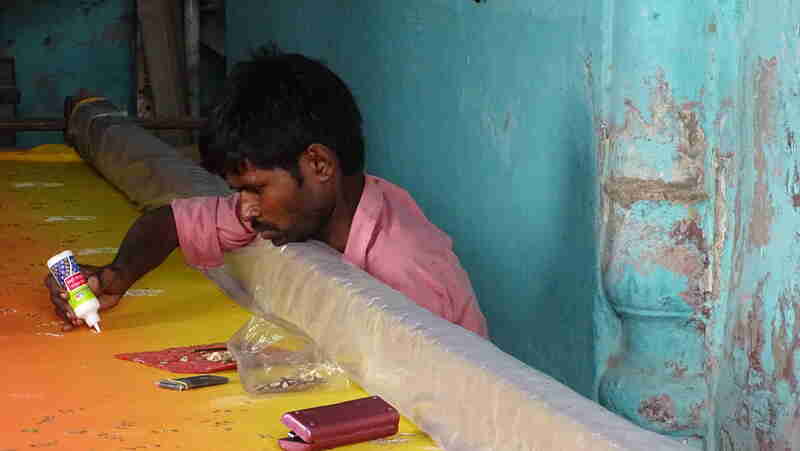 In a little room near the so-called Picture Gallery in Lucknow I saw this man labouring away at a piece of cloth which would be used once half a year later during a Shia muslim procession called the Chup Tazia. This ceremony has its origins in the later nawabi era of Lucknow, but has spread through India and Pakistan. This silent procession which marks the end of the mourning period of Muharram for Shias has been the cause of strife between Shia and Sunni muslims. The administration of Lucknow takes this very seriously, as you can see from this newspaper article from last year. So does this man, cooped up in a small room. Is it faith which drives him and others, or is it livelihood? Is there even a difference? During last week’s visit to Lucknow we tried out the two kababs which are special to Awadhi food: the Kakori kabab, named after the village of Kakori a few kilometers from Lucknow, and the Galawati kabab, whose name suggests that it is melted so that you don’t have to chew on it. We tried these two and the shami kabab in all the places which we ate in. After this extensive comparative tasting, we came to the conclusion that street food can be quite nice, but for the subtle craft of spicing one needs to go to some of the more refined kitchens in the city. These were the expected flavourful delights. What was quite unexpected were two excellent vegetarian dishes we found. One was a kofta with khubani (apricots). Khubani is an important part of Hyderabadi food, and it is not hard to imagine that it entered modern Indian cooking through Hyderabad and Awadh borrowing it from Mughal food. The aromatic gravy with nuts and spices which came with the kofta was clearly related to the spicing of the galawati kabab. So it was not hard to imagine that this was a reasonably authentic dish, or an invention by a cook who was well-versed in the style and technique of Awadhi food. The other vegetarian dish gives me more to think about. This was a dish with paneer and a paste of figs cooked in a rich curry with aromatic spices and nuts. The curry was again something one could well accept in any Awadhi food. The spare use of the fig paste could have been derived from a Mughal kitchen, and I’m willing to think of it as genuinely Awadhi ingredient. It is the paneer which I am conflicted about. Awadhi food contains a lot of hung yogurt, cream and ghee. Is paneer an authentic ingredient in this kitchen? By the 19th century paneer and chhana had definitely entered the Indian kitchen. Wikipedia asserts that paneer was known in India in the first century AD on the basis of the following sentences from this paper “People during the Kusana and Saka Satavahana periods (AD 75–300) used to consume a solid mass, whose description seems to the [sic] earliest reference to the present day paneer. The solid mass was obtained from an admixture of heated milk and curd”. This description fits the process for making yogurt. Harold McGee’s famous book describes yogurt, buttermilk and soured creams as being recorded during this historical period in large parts of the world, but gives a later date to the emergence of various kinds of cheese. I think the last word has not been said about the widespread introduction of paneer into Indian kitchens. It is possible that the Mughal kitchen had access to it, and the Awadhi cooks inherited paneer as an ingredient; but the dish that I ate felt more modern. One of the important components of Awadhi food are the rotis. The layered shirmal roti was hard to find, but the one which we eventually found was lovely and soft, although more infused with ghee than we would tolerate every day. We never managed to find a baqar khani roti, apparently you have to order these in advance. But we found a couple of parathas which seemed to be made in the same style as the shirmal roti. While the roomali roti of Delhi has become common fare even in the heart of Awadh, the art of Awadhi roti is alive. The late Mughal and early Company years are very intensely studied by historians. I hope someone, somewhere, is thinking of writing a history of food during this time. I read in a little brochure put out by the Archaelogical Survey of India that the Chhattar Manzil complex grew around the nucleus of a palace built by General Claude Martin for himself. This was sold to Nawab Saadat Ali Khan, who and whose successors built more around it to house themselves and their families. The same brochure tells me that the two connected buildings I see before me when I walk in through the gate marked CDRI are Chhattar Manzil and Farhat Bakhsh. The building with the minaret and round dome above it is the Chhattar Manzil, and to its left, as you face north, is Kothi Farhat Bakhsh. It was not clear to us whether we were trespassing, so we did not explore further. In 1951 this complex was given to the Council for Scientific and Industrial Research, which established the Central Drug Research Institute in this building. This prestigious institute outgrew the premises and moved out in 2012 when its new campus was ready. When we strolled in through one gate and out through another, the building seems to have been lying neglected for years. A rusty sign over a door proclaims a toilet. We see broken windows which clearly let in the rain. The derelict garden is host to a large number of butterflies. As we watch them, we hear a band of babblers quarrelling in the trees. It is a quiet Sunday morning in the busy heart of Lucknow. The imposing complex needs care. It served as a residence of the Nawabs until Wazir Ali Shah moved to his new palace in Qaiserbagh. The building still looks imposing, and it is clear that it can be renovated. A little work on the web led me to this feel-good news item about the state government’s plans to restore the complex and set up a museum and a library on the premises. The intention is good, and one hopes that the work begins soon. 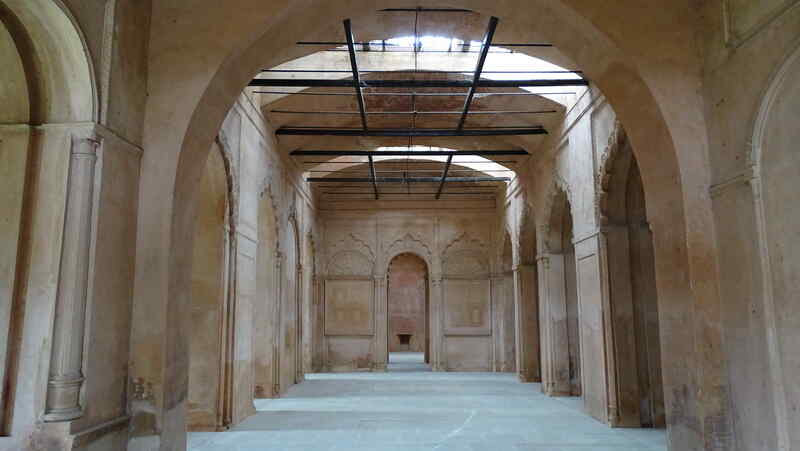 A palace complex which may have belonged to the sons of the Nawab of Lucknow was given over for the use of the British Resident of Lucknow in 1800. The buildings are made of lakhauri brick and lime mortar, and still show signs of external decoration. In 1856 the last Nawab of Awadh, Wajid Ali Shah, was deposed by the British East India Company and exiled to Kolkata. The next year, the residency came under siege during the War of Independence. Although the siege was eventually lifted, Lucknow was abandoned until the end of the War. The Residency was left as a memorial to the war, and never reoccupied. Even today one can see the marks of cannonball and shot in the brick and plaster. The Archaeological Survey of India has had the complex in its care since 1920. In recent years there have been archaeological digs at one end of the site. Some of the artifacts which have been recovered are on display in the museum on the grounds. The extensive grounds are now well-manicured gardens. There are more lovers than tourists in the gardens: history has a way of forgetting wars. 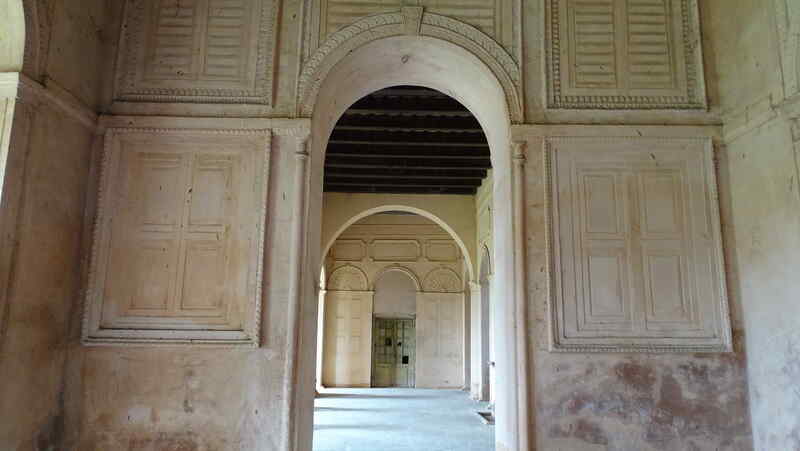 Lucknow is full of grand architecture: the Rumi darwaza, once the entrance to the city, Chhattar Manzil, initially built for the Wazir, but eventually the residence of the Nawab, Sikandar Bagh, once Wazir Ali Shah’s summer residence, but now remembered as the spot where the Company massacred 2200 Indian soldiers, the immense Qaiser bagh complex, still impressive. 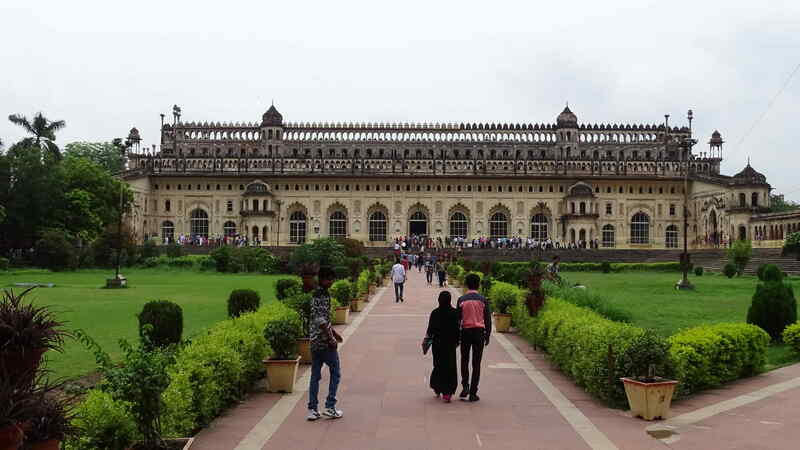 However, the defining piece of architecture from Nawabi Lucknow is the Bara Imambara. It was built during the time of Asaf-ud-Daulah, the Nawab who moved the capital of Awadh from Faizabad to Lucknow in 1775. The Bara Imambara impresses. 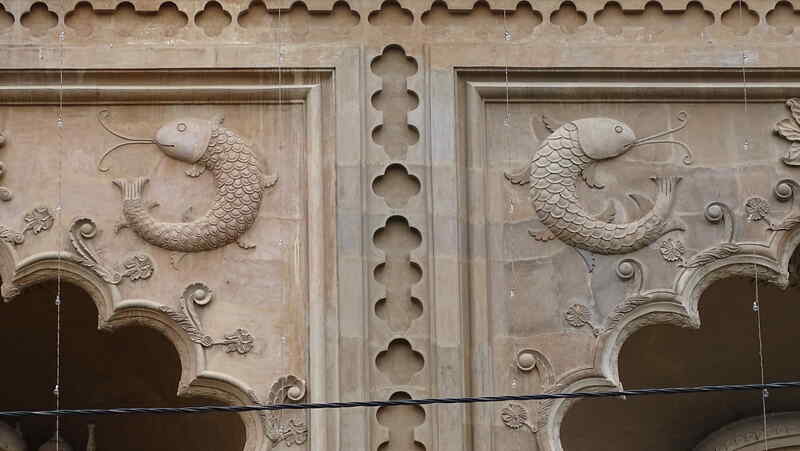 As I entered through the Naubatkhana with its huge fish symbols, I was prepared for marvels. They are there, but they reveal themselves slowly. You enter a gate, skirt a large garden and enter a second gate. After this there is a long walk to the Imambara. From a distance the Imambara looks beaten down by rain. As you approach you can make out a line of windows across the top. 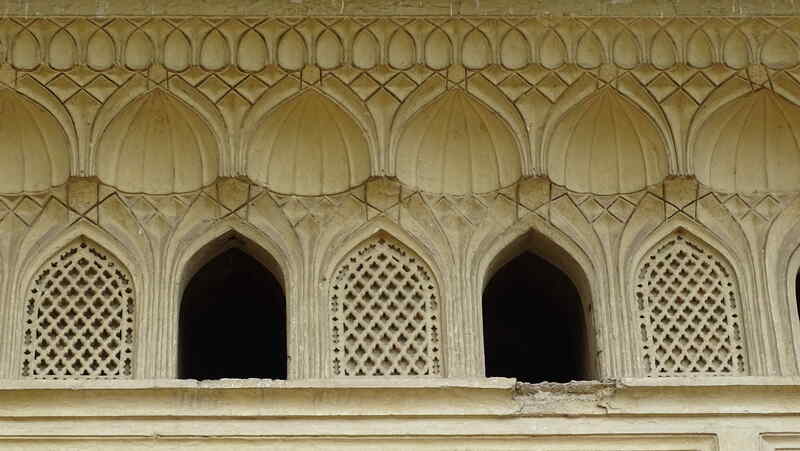 These are the external windows in the famous maze: the bhool bhulaiya. On the right is the Asafi mosque: its grand minarets and domes the colour of the surkhi which is the mortar binding the lakhauri bricks together. Off to the left is the Shahi Baoli: a three story structure above the well which was dry on the day we saw it. We heard a guide telling his group that the well fills up when the Gomti river overflows. 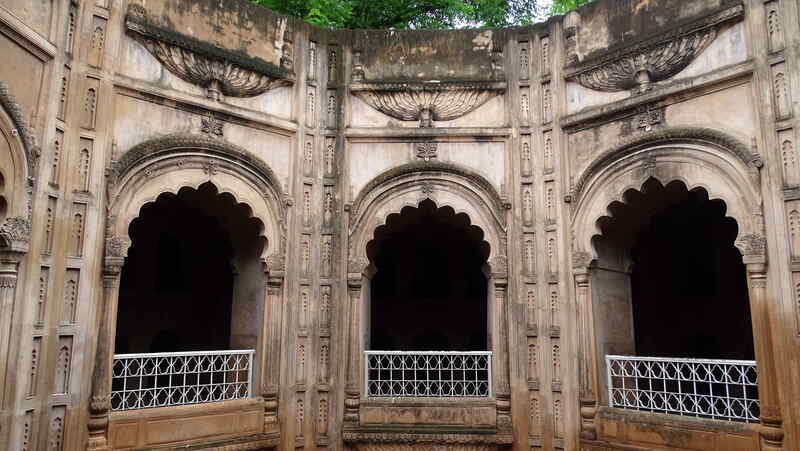 Since the baoli is within a few hundred meters of the river, it is possible that the level of the river water has something to do with the well. From the entrance about 50 steps leads down to a gate to the well, locked against visitors. We skirt the steps and walk straight into the second level above the well. 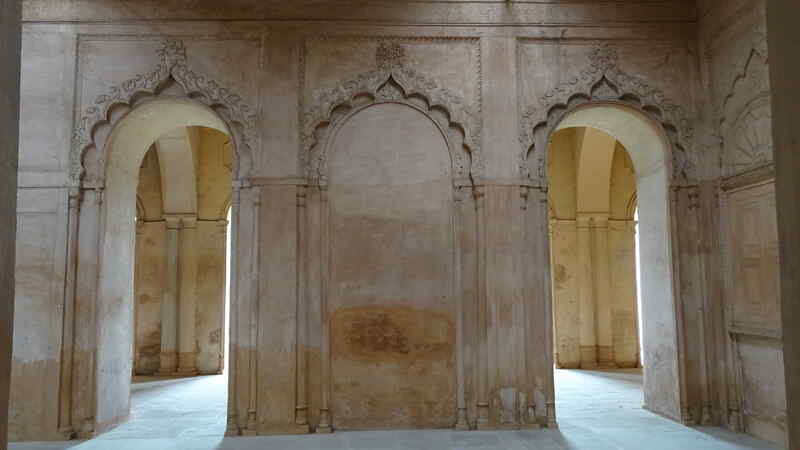 This baoli is impressive in the abstract geometry of the repeated arches, and its interaction with the light, not in architectural decorations. As we turn to go we see the Asafi masjid framed in the entranceway to the baoli. This is a mellow view: the stark lines of the mosque filtered through intervening greenery. It strikes me then that the Bara Imambara is a statement about state power: the architect, Kifayatullah, is conscious of the distances that one would have to walk from one part of the complex to the other. Only worshippers are allowed into the mosque, so we walk up to the main attraction. 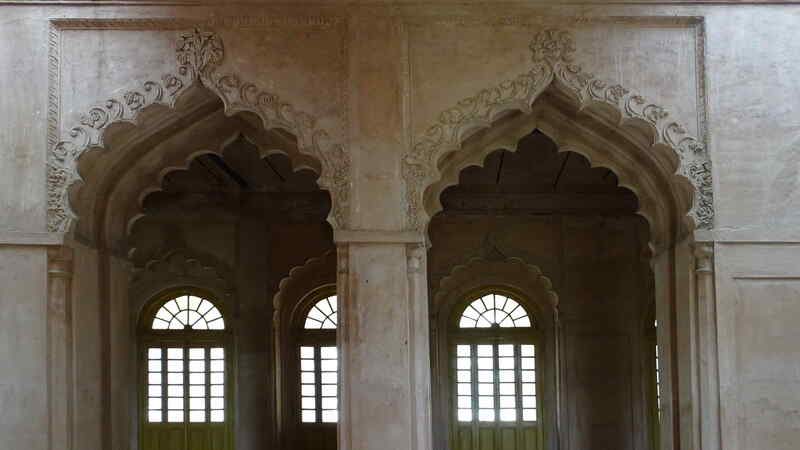 The characteristics of Awadhi architecture are the absence of iron and beams, the use of vaulted ceilings, multiple entrances on facades, parapets on roofs. All of these are present in front of us. Below the impressive facade is a kiosk selling water, other bottled drinks, and packets of snacks. It has been a very humid day, and we have used up all our water. We stock up, and as The Family drinks her cola, I look up at the blank arches of the bhool bhulayia right above us. The maze is supposed to have 489 identical doorways, and utilizes the differences in the heights of various rooms below it for part of its effect. The Bada Imambara is as impressive as I’d expected. The roof of the central hall is entirely without any support. This is even more impressive when you realize that there is no iron in the cantilevered roof: the 49.7 m by 16.6 m span is made entirely of lakhauri bricks, held together with mortar. A little search led to a paper on the material used written by some members of the Civil Engineering department of the nearby Indian Institute of Technology, Kanpur. The tomb of Asaf-ud-Daula lies under this impressive roof. This is flanked by two halls: the China hall is square at ground level, becomes octagonal higher up, then is sixteen sided at top, the roof of the India hall is segmented like an orange (although the word watermelon is used in various writings). All that remained was a guided tour of the maze, and a demonstration of the impressive acoustics of the whispering gallery above the India room. 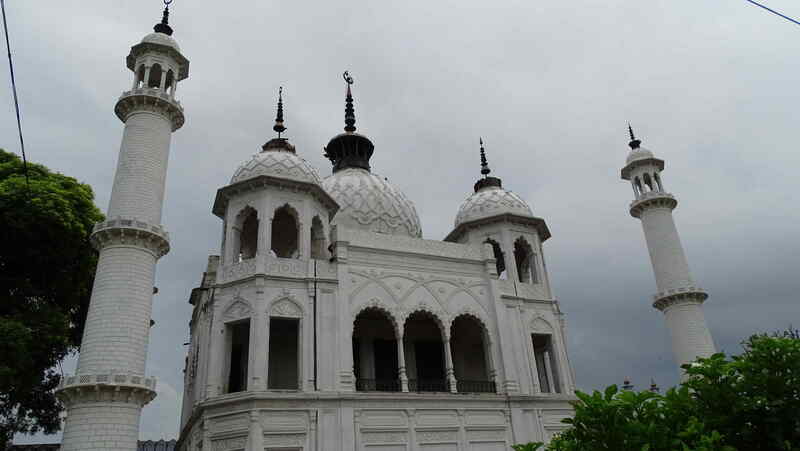 The Chhota Imambara dates from 1838, ie, the reign of Nawab Muhammad Ali Shah. 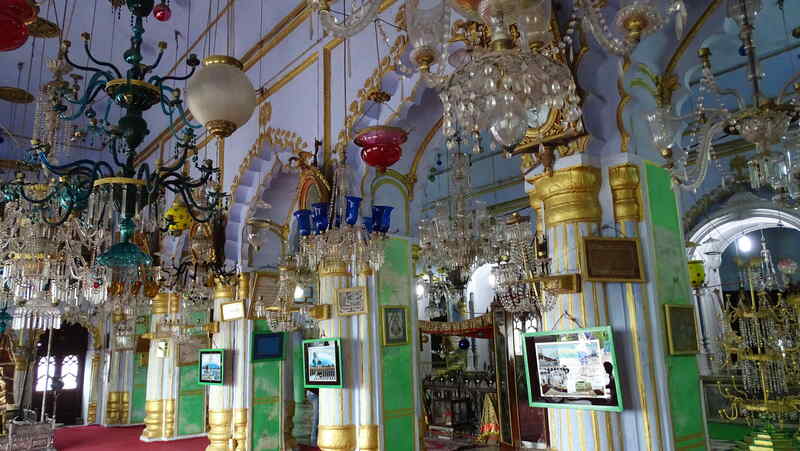 The graves of the Nawab and his mother are inside the Imambara. 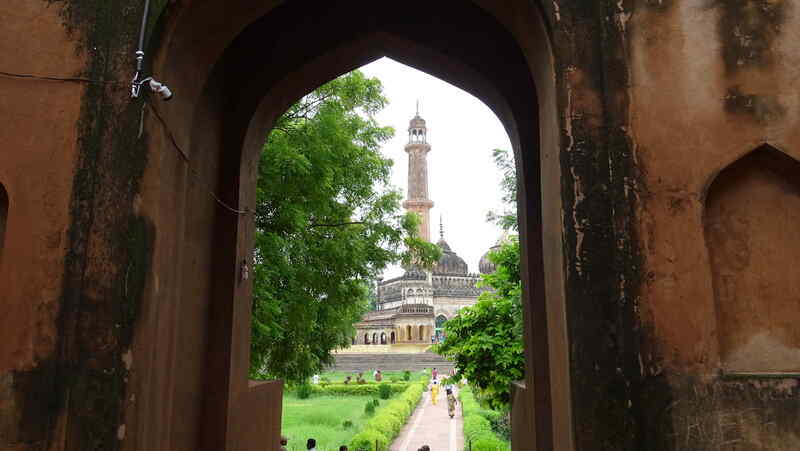 You pass through a large gate before coming to the Imambara complex. Unlike the Rumi Darwaza, this gate is not in great repair, so you can actually see how lakhauri bricks and lime mortar were used to build these enormous arches. I took the photo above so that I could study the technique without putting a crick in my neck. The construction is really impressive. As one enters the complex through the Naubatkhana, the hamaam lies to the left. This is a beautiful space with lovely blue and rose coloured walls, elegant tiles and windows with green glass which let in a lovely modulated light. The CFL bulb hanging above the bath was wholly unnecessary during the day. 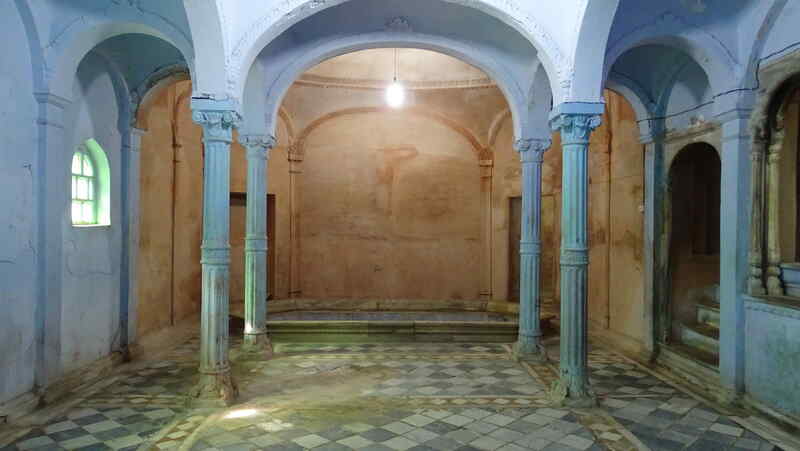 The hamam does not seem to be in use today. One of the most elegant parts of this complex is the Jawab opposite the grave of Muhammad Ali Shah’s daughter, Zeenat Algiya. It was attractive in the half-light of the monsoon, when I took the photo above. It remained attractive when the clouds blew away and the evening sun came out to play on the white exterior. 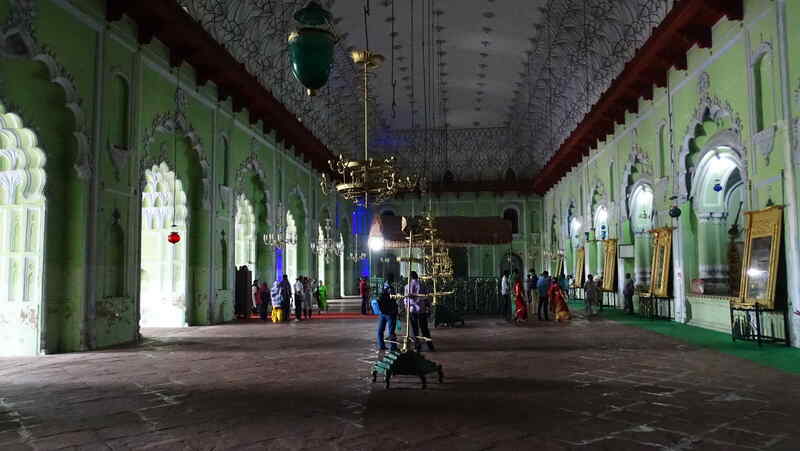 The Chhota Imambara belongs to the Husainabad Trust, which has now started on a well-meaning exercise to renovate the main structure. 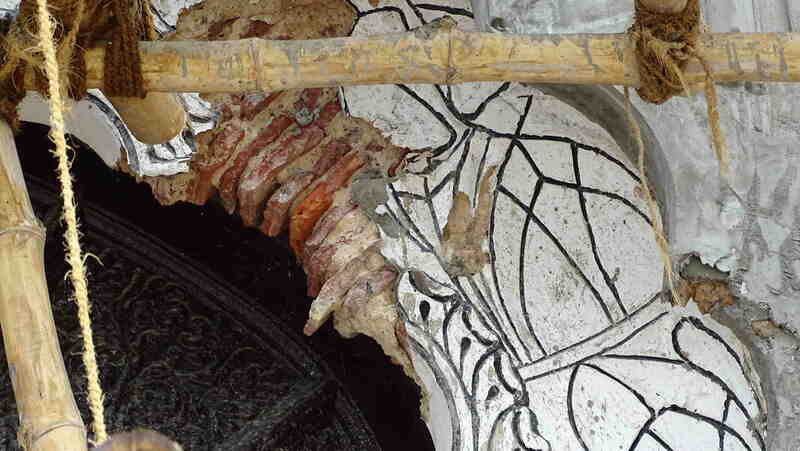 We saw the arches above the lovely carved wooden doors being renovated. The older construction was of lakhauri brick and mortar, as you can see in the photo alongside. 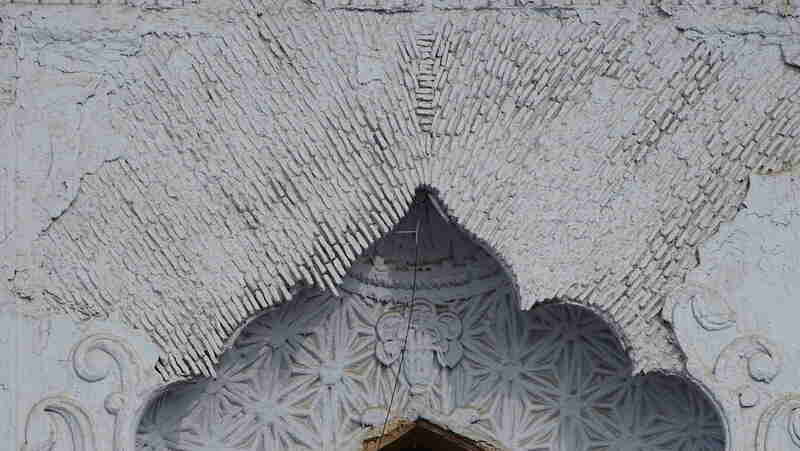 The structure of this arch is similar to that of the large arch in the photo on top. Unfortunately, these lovely old arches are being replaced by modern ones in reinforced cement, like the one on the left. The new arches are not ugly, they are quite nice and modern; but they efface the history of the structure. I hope that the detailed plans of the old structure remain in some architect’s studies. In future if the Trust wishes to return to a historically more accurate restoration they would come in useful. 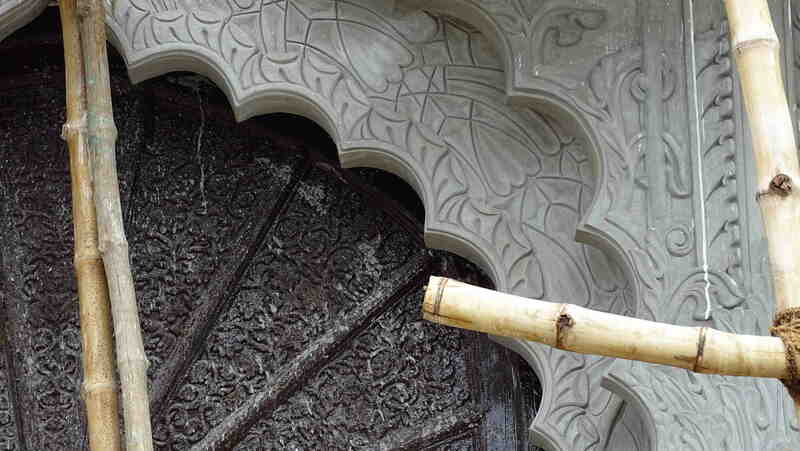 The Imambara contains elegant pieces of Arabic calligraphy in the form of birds. However, what left us stunned was the gaudy collection of lamps. I’ve never seen so many lamps and chandeliers, apparently all from Belgium, collected into such a small space. The effect is overwhelming. The Family asked a caretaker whether they are all lit sometime. We were told that they are lit during Muharram. We were invited to come and join the queue to devotees who flock to see this marvel. It must be, indeed. Rumi Darwaza was built in the time of the first Nawab of Lucknow, Asaf ud Daulah. The monumental structure of lakhauri brick and surkhi mortar was the entrance to the Nawabi capital city, the gate to the fabled hospitality of Awadh. The arch is topped by an octagonal cupola which was originally meant to contain lights. Around the exterior of the arch one can still see the pipes which made up an immense fountain. If this ever worked, then the underlying hydraulics would have been wonderful indeed, so I’m surprised to find no references to it at all. One can see a gallery half way up the interior, and I read that there is a staircase to access it. I did not search for the stairs. I walked through the gate, which now is a conduit for a constant stream of extremely variable traffic. On the outside of the gate is a busy road, in process of being widened. At the corner of every road which feeds into it is a taxi stand. 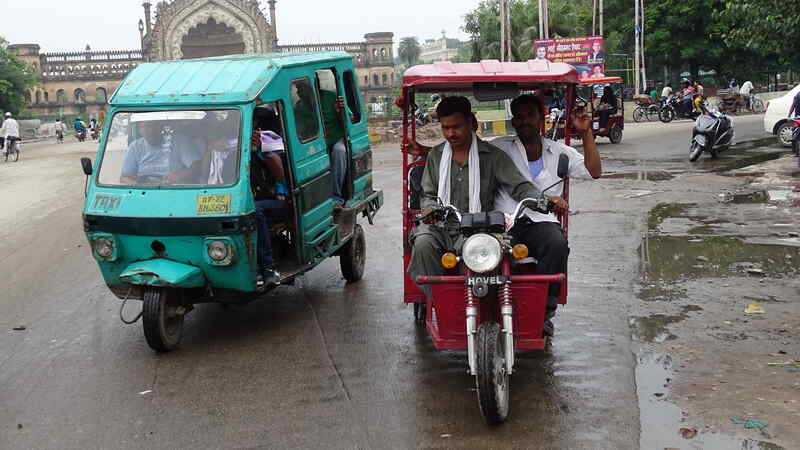 The variety of taxis and rickshaws was incredibly large. If you ever need to count how many different kinds of vehicles can be made into taxis, just come to one of these cross roads. I’m sure it will be hard to exceed any count made here. One of the most interesting things about the area is the food. Lucknow is reputed to be a place for refined food: kababs which melt before they pass your lips, slow-cooked biryani, figs and apricots in curries, multiply-layered roti. 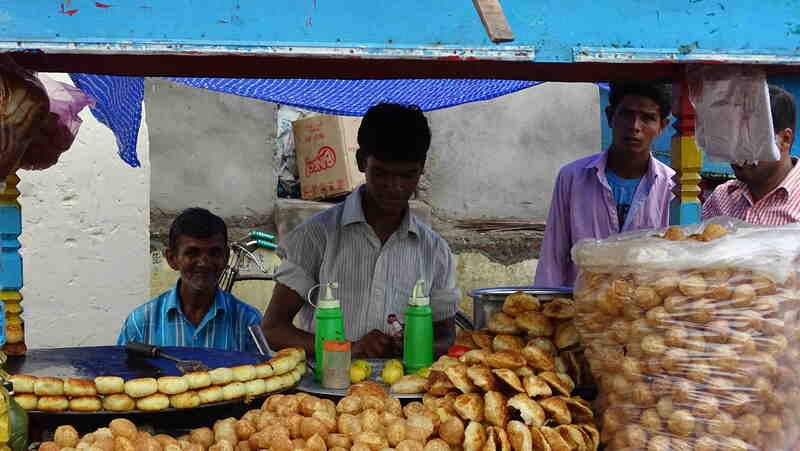 But around this gate I found carts which were full of simpler puri, kachori, and alu tikki, all doing good business at lunch time. 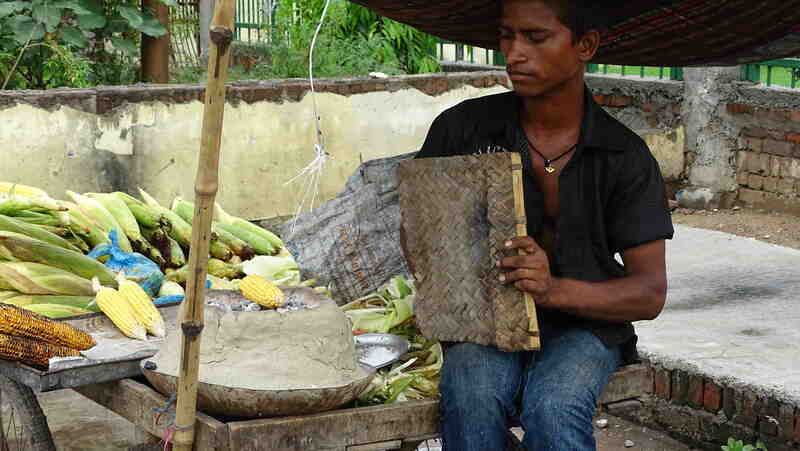 Interspersed with them were the carts where you could get grilled corn: bhutta. In the middle of the day they did not seem to attract customers, but the fact that there were several carts meant that later in the day their popularity would rise. 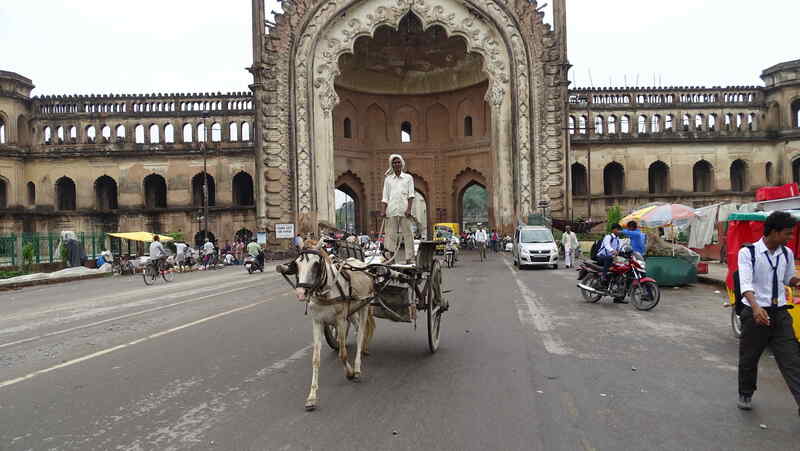 There are no tourists outside the Rumi Darwaza, they stay on the Lucknow side of the gate, where the Bada Imambara lies. In spite of the fact that there are interesting buildings on the outside, like the Picture Gallery and the Chhota Imambara, this seems to be the domain of the locals. 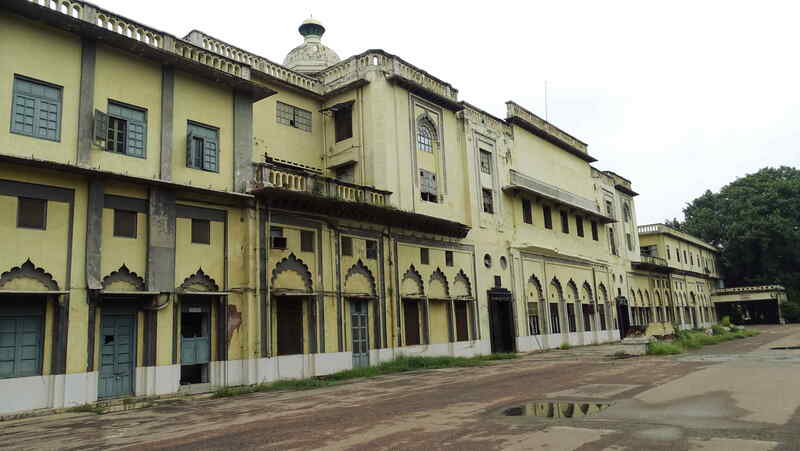 The building now known as General Kothi was constructed in Nawab Saadat Ali Khan’s time (1798 to 1814). The first resident was Shas-ud-Daulah, the Nawab’s eldest son and the general of his army. It seems to have got its present name during the time of Nawab Wajid Ali Shah (1847 to 1856). His chief of the army, Hashmat Ali, who lived in this building, liked to be known as a General, giving rise to this name, and its variant, Jarnail Kothi. 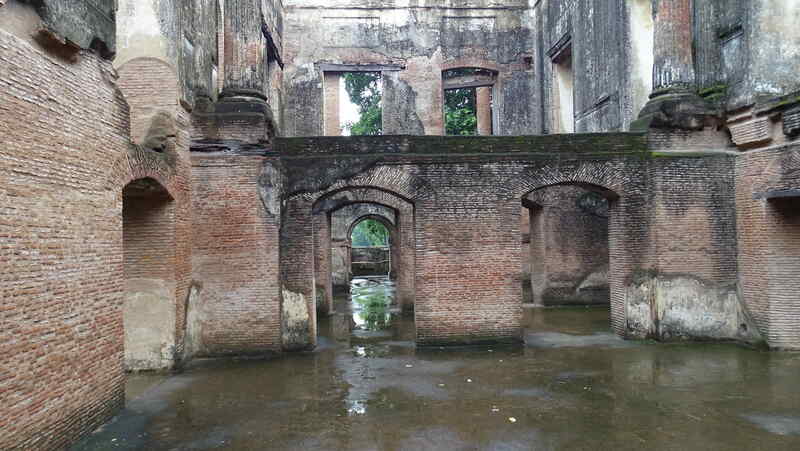 The General Kothi is now undergoing restoration and the museum at the Residency will be moved here once the work is completed. This is being called an example of a new idea called adaptive re-use of ancient monuments. When you think about it, the first example of this idea which comes to mind is the building right next door: the palace complex called the Chhattar Manzil which used to belong to the Nawab. 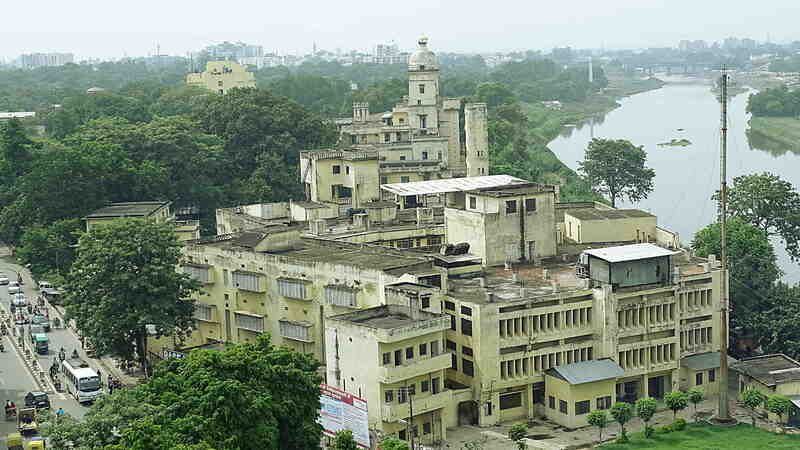 In the days immediately after independence, the complex was given over to the Central Drug Research Institute. In retrospect one wonders whether it is wise to re-purpose an important historical space, without providing an adequate budget for conservation. The CDRI gets its funding through the Council of Scientific and Industrial Research, under the Ministry of Science and Technology. However, conservation funding is usually channeled through the Ministry of Culture. Looking at the delapidated state of the Chhattar Mazil today, one wonders whether its conservation has fallen foul of the usual turf lines between ministries: Culture does not own it, and Science and Technology budgets cannot be used for conservation. 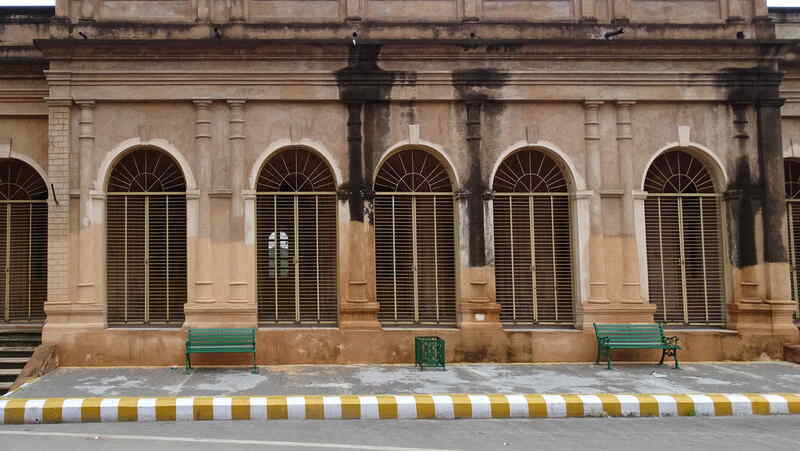 The restoration work in the General Kothi brings up questions of its own. The inside looks beautiful. The surkhi colour of the walls looks authentic, the details on the arches are lovingly done. But the bricks stacked up for the work are modern. A building of this age may have been originally done in lakhauri brick. I walked around to the back and found an exposed part of the exterior which still has older plasterwork. In the parts where the plaster has fallen away, the bricks visible are modern. How can this building then be as old as the early 19th century? Was there an earlier restoration which I could not trace? General Kothi: the northern gallery. I’ll love to come back here when the work is complete and the museum of the 1857 war has moved here. I hope that by then there will also be a small exhibit on the history of this building which answers the questions I now have. What is Awadhi cuisine really? Awadhi cuisine refers to the style of cooking which developed in the Awadh region after the capital of the kingdom shifted to Lucknow and until Wazir Ali Shah was overthrown by the British East India Company in 1857. But is there really an Awadhi cuisine, or is it the product of a marketing campaign? Between the hype and the plagiarism which one finds on the web, it is very hard to make out the truth. Wikipedia’s article on Awadhi food repeats the story of the famous Tunday’s kabab shop being a hundred year old. If this were correct, the eponymous one-armed cook would have set up shop only in 1915; sixty years, and two generations, after the reign of the Awadhi nawabs ended. The article also says that the kababs are famous because of the 160 ingredients which go into the secret recipe. This is directly contradicted by an article in Indiamarks which states "Awadhi cuisines are not a concoction of hundred odd spices instead the difference lies in the preparation of the food by preserving all the nutrients in the cooking [sic]". Clearly both sources cannot be right. The second article seems to plagiarize other sources on Awadhi food. It is difficult to decide which is original: the article quoted above, these slides or this self-published article. Perhaps none of them are. Then there are the famous chefs, whose pronouncements are always made with an eye to a bottom line. An article in the Times of India discusses the Awadhi cuisine produced by a big-name chef, then at the Hilton, including "khatti macchi (fish braised in yoghurt gravy) [sic]". The mixing of yoghurt and fish is such a strong taboo for Muslims (and Jews) that this cannot be an Awadhi speciality. The real Lakhnawi khatti machhli is quite different. Awadhi food is important to us because it is the beginning of modern Indian cooking. Most of the ingredients we use today would have been available two hundred years ago, and the techniques developed then would still be in use. So the taste of Awadhi food is perhaps not very different from what we think of as our "fancy cooking". Awadhi food developed on the Mughlai style. One of the source books for Indian food, namely K. T. Achaya‘s Indian Food: A Historical Companion tells us that although many of the Mughal emperors were abstemious near-vegetarians, their courtiers would have eaten naan, keema, kababs, rice and phirni. Travelers mention do-piyaza, meat and rice cooked together, khichdi, lemonade, dahi and dinners with fifty dishes, including fruits, wild animals and birds. One way to trace the history of food is to follow the names of dishes back as far as one can. A search of Google ngrams reveals that in the Google corpus the name shirmal roti debuts in 1959, seekh kabab in 1947, shami kabab in 1921, and dum aloo in 1966. In this corpus, the word kabab can be traced back to an English cookbook printed in 1831. According to this source, the minced meat for the kabab has to be marinated in a mixture of salt, ginger, coriander, cloves, cardamom, black pepper, onions and saffron mixed into a paste of hung yogurt, cream and a whole egg. The marinated meat is to be cooked in ghee. This mixture of spices recurs through the book. Moreover, this kind of garam masala is precisely what we would turn to in our own kitchen now and then. Until a modern Achaya publishes research into 19th century Urdu, Hindi and Indo-Persian texts on food, I can only dredge my own memories of what an occasional brush with a khansama or bawarchi in my childhood would bring: baqar khani roti, shami kabab (not the version described in Wikipedia), pasande, murabba, and zarda. The truth is never simple, but the search for it can be amazing. I plan to be amazed by my search for true Awadhi food next weekend in Lucknow. Author I. J. KhanewalaPosted on August 9, 2015 January 10, 2016 Categories Food, History, IndiaTags Awadhi cooking, baqar khani shirmal roti, Lucknow, murabba, pasande, shami kabab, Uttar PradeshLeave a comment on What is Awadhi cuisine really? Classic Urdu poetry flowered in the eighty years of the ascendancy of Lucknow: from 1775 when Asif ud-Daula moved the Awadhi capital from Faizabad and invited poets, architects and artists to the new capital, to 1856 when the East India Company deposed Wazir Ali Shah. Today’s most popular memory of this golden age is in the melancholy ghazal (which always remind me of the soppy country number in The Blues Brothers). The ghazal is a set of couplets called shayari. The shayari, however is a form in itself: often biting and satirical, and often full of sly humour. Here is one from Mir Taqi Mir (I’m afraid I can’t transliterate from Devanagari to the Urdu Nastaliq script). From the tone of his poetry, it seems that Mir would appreciate the irony in his gravestone being bulldozed to make way for a railroad.